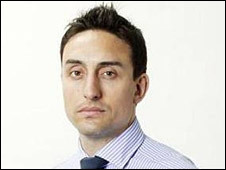 David Bond, who was passed over for the role when the BBC appointed its first sports news specialist nearly three years ago, was this evening named as the corporation’s new Sports Editor. The announcement, made by the BBC after 5pm tonight, will be a massive blow to the Daily Telegraph‘s sports department, where Bond has been Sports Editor since April 2008. It was only last month that Bond announced the signing of Jacquelin Magnay as the paper’s Olympics Editor, part of the Telegraph‘s plans for the 2012 London Games which he was overseeing. Bond replaces Mihir Bose, who resigned in July after two and a half years in the newly created job, apparently because he refused to be part of the department’s move to Salford in 2012. Replacing Bose is already a familiar role for Bond: he became the Telegraph‘s sports news correspondent after Bose’s departure from the paper. Bond began his journalistic career on the South London Press covering Millwall, the football team he supports. Before moving into his management role at the Telegraph, he had developed a formidable reputation for delivering hard news sports stories at the Evening Standard, Sunday Times and then the Telegraph. Yet when last week the Daily Mail published a four-man shortlist for the coveted BBC job, Bond’s name was not on the list. Sources close to the BBC had been suggesting that as well as having to agree to relocate to Salford, the successful candidate needed to be “low maintenance” and have extensive live broadcasting experience, something which Bond lacks. With the salary scale reputed to be less than £100,000, it is likely that Bond will be taking a significant pay cut to move to the BBC. Bond is due to take up his new job – which comes under the BBC’s news directorate – in the new year. “This is a once-in-a-lifetime opportunity which I simply couldn’t turn down and I am extremely honoured to have been given the chance by the BBC,” Bond said. Mark Byford, the BBC Deputy Director General and head of journalism, greeted Bond’s signing by saying: “I am delighted David is coming on board. “We are determined to develop the prominence and impact of high quality sports journalism across our news programmes and services and the Sports Editor is a pivotal role in that quest. David Bond’s flair, insight, energy and expertise made him the outstanding candidate”.